Many people insist that men over the age of 40 with grayed temples are the most charming. But what about these men who tend to have grey hair at younger ages, even long before they turn 30? In most cases, white people are beginning to show gray hairs around the mid 30s, Asians just before they turn 40 and African Americans in the mid of 40’s. In fact, half of all people-regardless their skin color- are more likely to turn gray until the age of fifty. The cause for gray hair is Melanin, the pigment that gives human skin, hair, and eyes their color. Dark- skinned people have more melanin in their skin than light-skinned people have. Melanin is produced by cells called melanocytes. 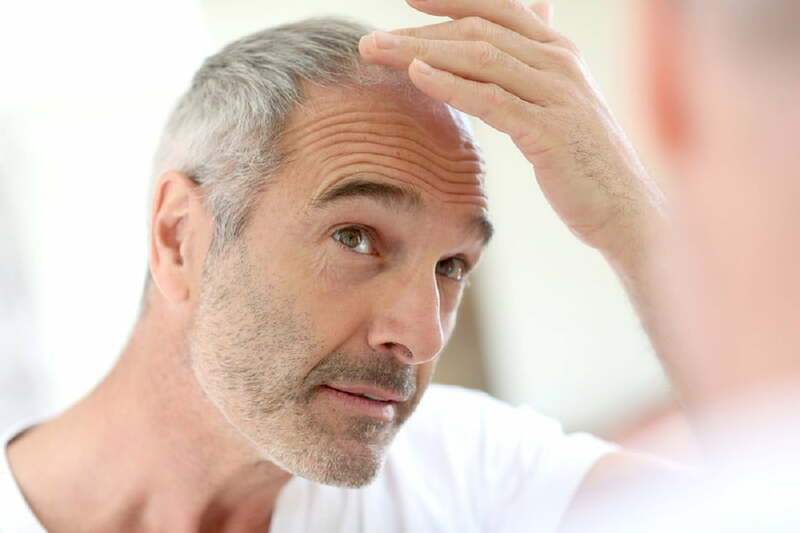 The main reason for graying hair, is none other than the genes. Just as with alopecia, genetic predisposition plays the most important role. According to scientists, genetics not only determines the hair color but even the age from which our hair begin to change color. The stress levels enhance the production of hydrogen peroxide, the excess of which then is accumulated within hair follicles, causing the death of the melanocytes which causes graying of hair. Smoke is responsible for the premature graying of hair and according to scientific studies and surveys, people who smoke regular have a greatly increased risk of developing gray hair; and even in young; compared to non-smokers . According to scientific studies, proper nutrition plays a key role in the issue of hair loss but also in terms of graying hair. Nutritious diets that includes foods rich in antioxidants, calcium and amino acids, promote melanogenesis, melanin production process, which is necessary for the hair to retain its natural color. Instead, diets that are poor in nutrients, don’t contribute in pigment production, substantially speeding up graying hair. The Vitiligo is a skin condition in which some areas gradually lose their normal pigment and become white. Specifically, the organization itself destroys -for some unknown reasons- melanocytes in some parts of the body and thus is not produced there melanin, thereby whitens the skin, the hair and beard. It is an autoimmune disease, which does not belong to an infectious or contagious disease and is not transmitted by physical contact. However, it is associated with certain diseases such as thyroid. Some hair care products not only help in grooming the hair but instead cause damage. Indeed, several of these (such as shampoos and hair dyes) contain an increased amount of hydrogen peroxide (oxidizing natural) that prevents the production of pigment resulting in the appearance of gray hair.